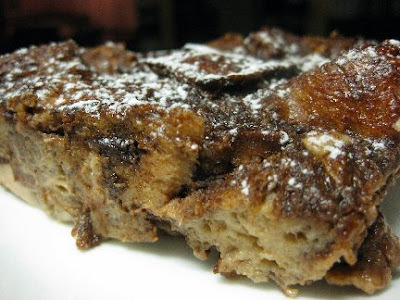 This week's pick made me very happy as I love bread pudding! I hadn't tried a chocolate version before so was curious to taste the results. As it was around Easter I decided to replace the challah/brioche with leftover hot cross buns. I made a smaller version than the recipe using 4 buns each sliced into 9 rough cubes which fit perfectly into the dish. I also figured this would add enough dried fruit and spice so I left out the raisins. I think I must be a bread & butter pudding purist, because while I liked this I didn't love it. We actually had a little piece leftover that ended up in the rubbish. That NEVER happens in this house! I think the chocolate flavour overwhelmed it. Maybe it was using hot cross buns rather than plain brioche. But then chocolate hot cross buns are fabulous. I just don't know! Thanks to Lauren of Upper East Side Chronicle for this week's pick. You can find the recipe on her blog! I'm with you. I was shocked to find that I didn't love the combo of bread pudding and chocolate. Really shocked. But this one just didn't do it for me. I think I might make the recipe again w/out the chocolate and maybe with a rum or whiskey flavoring. I think it's worth experimenting with! 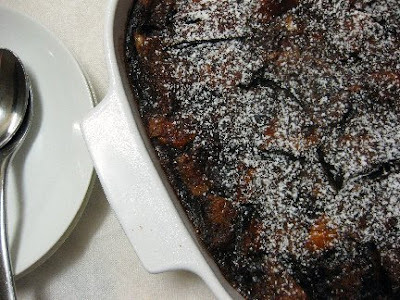 It looks wonderful - I'm not a huge fan of bread & butter puddings, so I loved this one. Sorry you weren't quite blown away. This was my first time making or eating bread pudding. It was just an okay for me, too. It looks good, though! I do prefer vanilla custard bread pudding, but this was very good too! I tried mine with chocolate sauce and also tried it with cream anglais. Excellent both ways! Agreed. I liked, but didn't love it either. Although, the next day it was fabulous right out of the fridge! I used donuts for mine. It looks great! Sorry you didn't like it. There's always next week! Great idea to use hot cross buns. Too bad you didn't really care for it, tho. I love bread pudding, but an also a purist. Curious to try tho. Yours does look yummy! I think using up the leftover hot crossed buns in this was agreat idea, even if something was missing in the end result. It looks delicious.